A recent study1 demonstrated that greening was associated with a significant reduction in gun assaults from 1999 to 2008. Vacant, overgrown lots negatively affect neighborhood economies and create a permissible environment for crime. 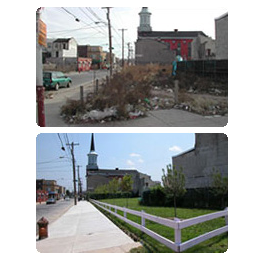 To combat these public health and safety concerns, the Philadelphia LandCare Program (PLP) "greens" vacant lots by converting the spaces into areas with high visual impact, by clearing trash, planting grass and trees, and encircling the site with a low wooden fence. 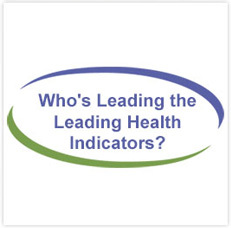 To determine program effectiveness, PLP provides data to researchers at the University of Pennsylvania and elsewhere to assess PLP's impact on crime, as well as resident health and well-being. A recent study1 demonstrated that greening was associated with a significant reduction in gun assaults from 1999 to 2008. Over this time period, 4,436 vacant lots (7.8 million square feet) were greened. This study also showed that vacant lot greening was associated with residents reporting less stress and more exercise in select sections of the city, indicating that greening may improve resident health and quality of life. Other cities are adopting PLP to improve neighborhood livability, public health, and safety. Watch this video to learn more about the Philadelphia LandCare Program! 1Branas CC, Cheney RA, MacDonald JM, et al. A difference-in-differences analysis of health, safety, and greening vacant urban space. Am J Epidemiol. 2011 Dec 1;174(11):1296–1306. doi: 10.1093/aje/kwr273. Epub 2011 Nov 11. Pennsylvania Horticulutral Society motivates people to improve the quality of life and create a sense of community through horticulture. Branas CC, Cheney RA, MacDonald JM, et al. A difference-in-differences analysis of health, safety, and greening vacant urban space. Am J Epidemiol. 2011 Dec 1;174(11):1296–1306. doi: 10.1093/aje/kwr273. Epub 2011 Nov 11.